The efficiency model predicted upsets by Cleveland over Baltimore, Detroit over Chicago, Buffalo over the Jets, Tampa Bay over Carolina, and Kansas City over San Diego. Overall, the efficiency model correctly predicted winners in 9 out of 12 games. The consensus favorite, as defined by betting lines, was only 3 out of 11 as of Sunday evening. (The difference in total games is due to the GB at MIN game being a pick 'em, i.e. point spread = 0). Game probabilities for week 4 are listed below. The probabilities are based on an efficiency win model explained here. The model considers offensive and defensive efficiency stats including running, passing, sacks, turnover rates, and penalty rates. Team stats are adjusted for previous opponent strength. For now, the projections don't account for future strength of schedule. For example, notice how strong the AFC S appears. Obviously, they have to play each other frequently, so it would be very rare for a division to win so many games. At this point so early in the season, you should pay most attention to the relative ranking of each team rather than the projected win total. Team efficiency rankings are listed below in terms of generic winning probability. The GWP is the probability a team would beat the league average team at a neutral site. Each team's opponent's GWP is also listed, which can be considered strength of schedule. The adjusted GWP (ADJGWP) modifies the generic win probability to reflect the strength of to-date opponents. A full explanation of the methodology can be found here. Throughout the rest of the 2007 season I intend to publish win probabilities for each game, and season win projections for each team. This post explains the methodology used to calculate these. Home field is also included in the model. These factors were selected because they are most predictive of future performance, and not necessarily because they explain past performance. Over the past five seasons, the model predicts winners correctly in 69.8% of games (retrospectively). In 2006, the model was correct in 65% of games, well ahead of consensus favorites as determined by betting lines. Last year was particularly difficult year for prognosticators, as consensus favorites only won 57% of the games. Touchdowns, or red zone performance, or third down success rates are not used in the model because I believe those things are the results of passing and running ability etc. To include them in a model intended for prediction would guarantee it is severely "overfit." In other words, it would capture and explain the unique qualities of past events at the expense of predictive power. Once the model is established, each game's outcome probability can be calculated. But there are other applications. By calculating the probability a team will win against a notional league-average team at a neutral site, a generic win probability can be determined for each team. This year the model includes an adjustment for opponent strength. This is especially important earlier in the season when there are fewer data points to establish each team's baseline performance levels. Each opponent's generic win probability is averaged for each team. It is then included back into the win model to refine each prediction. For example, a team with impressive stats against weak teams would not be favored as strongly as a team with similar stats against strong teams. Another application of the opponent-adjusted generic win percentage is a ranking of each team. Such a ranking is similar to the now ubiquitous "power rankings." A better term for the rankings on this site would be "efficiency rankings." Lastly, final win totals can be estimated by calculating the probabilities of a team's future games. By using the law of total probability, the probility that each possible final record will occur can be determined. For example, if a team has two games left, one with a 0.7 chance of winning and one with a 0.5 chance of winning, the probability of winning 0, 1, or 2 games can be calculated. The same math can be applied with many more games to go but becomes far more complex. Then once we determine the most likely winning percentage for each team, we can compare those expected values to actual outcomes to determine which teams have been lucky or unlucky. Lastly, as playoff time approaches, we can go one step further. By applying the same principal of total probability, the outcomes of playoff races can be estimated. Note: The actual game prediction model and coefficients can be found here. Similar to my efforts to devise a better QB rating, I've applied the same method to estimating the wins contributed by running backs. Although not perfect, it provides a sense of who is helping his team and who is hurting his team, and by how much. The components of the RB rating are weighted according to how important they are in terms of team wins. The formula is based on a multivariate regression model of team wins. Using data from the past five NFL regular seasons, the regression model estimates team wins based on the efficiency stats of each team including passing, running, turnovers, and penalties. The rating includes Yards Per Carry (YPC), fumble rate, and an adjusted Yards After Catch per reception (YAC/Att). YAC/Rec is adjusted to reflect the fact that RB receptions constitute 14% of all team pass attempts. Fumble rate is defined as fumbles per carry plus receptions. Some may ask why I don't include touchdowns in the rating. Touchdowns are the result of yards per carry, reception yds, etc. Including TDs would also skew the rating towards the Alstott-esque "vulture-backs." Also, rushing TDs are often the result of an excellent passing game that frequently gets the ball close to the goal line, and not necessarily the result of good rushing. The resulting ranking of 2006 RBs is below. Keep in mind the list assumes a full 16-game season for each RB. The QB Wins Added Per 16 Games stat (+WP16) estimates how many wins a quarterback adds to his team's record over the course of a 16-game season. +WP16 is explained here and here, as well as in the last post. Last year's ratings can be found in the second link. Here is the list of 2007 QBs and their vital stats through week 3. The +WP16 stat basically tells us how much a QB is hurting or helping his team. For example, Tom Brady's performance to date would take a team that is completely average in every other way to between a 13 and 14 win season (8 + 5.57 = 13.57). We keep hearing how Rex Grossman costs the Bears wins. Is that true, and if so, how many wins? Sure, Grossman's NFL passer rating is the lowest of all starting QBs. He has 1 TD and 6 INTs in 3 games. Clearly that's not good. In this post, I'll estimate how many wins he would cost his team if he were allowed to continue playing at his present level of performance. The estimate is based on an improved passer rating formula. The components of the new rating are weighted according to how important they are in terms of team wins. The formula is based on a multivariate regression model of team wins. Using data from the past five NFL regular seasons, the regression model estimates team wins based on the efficiency stats of each team including passing, running, turnovers, and penalties. Regression models can hold all other factors equal, so by only adjusting the factors of interest (QB passing, rushing and turnover performance) we can calculate the effect of QB performance on the estimate of season wins. Total yards includes air yards, rushing yards, and sack yards. Total plays includes pass attempts, rushes, and sacks. Turnovers include interceptions and half of all fumbles (lost or not). The equation subtracts 4.5 because that is the average +WP16 score for QBs in 2007 so far. An average QB on an average team would win 8 games, not 12.5. So holding all other factors equal, Rex Grossman would cost his team 3.4 losses over the course of a full season. Last year Grossman was in the middle of the pack with +0.3 wins added. He did what the Bears asked of him, which was to break even and allow the defense and special teams to make the difference. This year, not so much. I previously looked at FG kicker performance. My evaluation of each kicker was based on how much better the kicker did than would be expected given how distant his attempts were. However, there were several flaws in the original analyisis, which I've hopefully corrected here. 1. Vandergajt's perfect 2003 season was an outlier that distorts the data greatly. Technically, the regression treated his average miss distance as zero, which made his expected accuracy very low. I decided to exclude this one season in the regression. 2. I realized that including average miss and made distances in calculating expected FG% severely overfits the data. Average miss and made distances are affected directly by missed and made field goals, which is essentially what FG% is. Although those variables help describe the distribution of FG attempt distances, they hurt more than help the model. I excluded them. 3. It was pointed out that many of the top kicker seasons belonged to warm weather and indoor kickers, so the model needs to account for home field environment. I included dummy variables for indoor stadia and warm weather teams. 4. It was also suggested that I should use a non-linear relationship between average attempt distance and FG%. For example, a 50-yd FG attempt is more than twice as difficult as a 25-yd attempt. The best fit turned out to be logarithmic, so I used ln(FG%) as the dependent variable in the regression. In case anyone is curious, the graph below illustrates the average FG% for kicks from various distances. Below are the results of the regression (n=122). About 8% of the variance in FG kicker seasonal performance can be accounted for by situational variables: average attempt distance, warm weather, and a domed home stadium. Indoor home stadiums and warm weather kickers do not appear to enjoy a significant advantage throughout a season. Neither variable was close to significance. I got the same results for Indoor and Warm Wx regardless of various combinations of independent and dependent variables. But I left both variables in the final regression model. It's a general rule to keep insignificant variables in a model if their coefficients have the expected sign and they would intuitively help account for factors that are not the primary focus of the model. Although the coefficients may be less than perfectly accurate, they help get you closer to the truth than farther from it. The table below lists each FG kicker's performance from the 2003-06 seasons. The list is sorted from best to worst in terms of exceeding the expected FG accuracy given each kicker's average attempt distance and home stadium environment. One thing that immediately stands out to me is how consistent some kickers are. Notice how many times some kickers' seasons are stacked together in order--Wilkins, Longwell, Akers (twice), Cundiff, Carney, J. Brown, and Edinger. 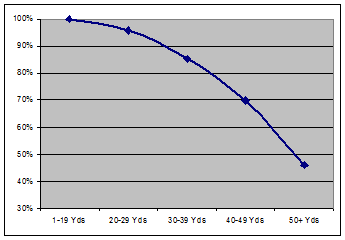 Some kickers are incredibly inconsistent--Janikowski and Vanderjagt in particular. The bottom line in this analysis is that, accounting for attempt distance and home stadium environment, the standard deviation of adjusted accuracy (Actual - Expected FG%) is 7.7%. A FG kicker one standard deviation above the mean kicks 7.7% more accurately than expected given his attempt distance. The average number of FG attempts for a team is 29, so an extra SD of accuracy would yield an additional 2.33 field goals worth 6.7 points in a season. A rough estimate of the spread between best and worst FG kicker each year is about 34% of accuracy. That would equate to a difference of 9.9 field goals worth 29.6 points. This makes sense because it represents roughly a 4-standard deviation spread between best and worst. The kickers who had enough qualifying attempts over the 2003-2006 seasons are ranked below in terms of how far they exceeded their expected FG% given their average attempt distance. Vanderjagt was manually assigned the top score for 2003 for his cumulative ranking. The number of years each kicker qualified is also listed. Take the guys with 1 or 2 years of kicks with a grain of salt.